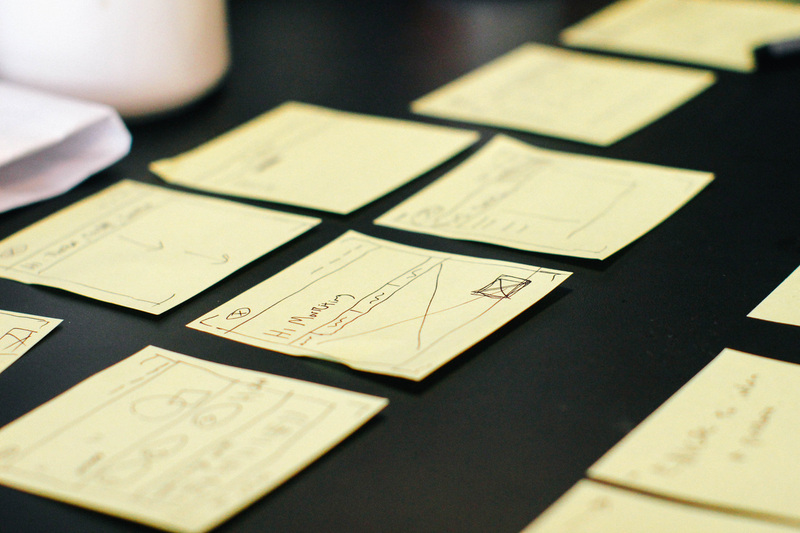 We would like to give you a "heads-up" as to what will be coming in the near future. We hope you will find this helpful in planning your schedules. Holy Angels Art Club 1st Annual Art Exhibit! Stop in after Mass to see the beautiful works of art displayed by members of the Art Club. Coffee and dessert will be served. 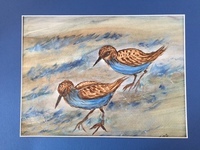 Parishioner Jerry O’Donnell is the art instructor and a wonderful watercolor artist himself! The Art Club meets each Monday at 10:30am in the Ministry Center from September to June. 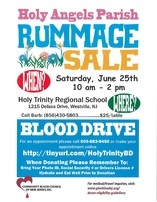 The Community Blood Council of New Jersey will have their mobile van onsite amidst the yard sale. Proceeds benefit Holy Trinity Regional School and the Health and Wellness Ministry. Adoration every Monday at 7pm in St. Patrick Church. Come and spend some time in the presence of Jesus in the Blessed Sacrament. Art Club meets every Monday at 10am in the Ministry Center from September to June. Coffee Klatch meets every Thursday following the 9am Mass in St. Patrick's Lower Church. 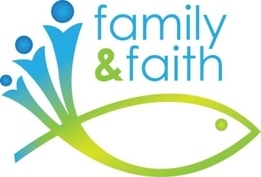 Family Faith Formation Summer Session will run for two weeks, Monday to Friday, from 8:30am to 12:30pm beginning July 11 until July 22 at Holy Angels Faith Formation Center. For more information call 856-845-1660. Gathering of Women's Lunch Group meets every other Wednesday in the Worship Center at 12:30pm. Join us for ladyship and sharing! Bring your own lunch and beverage. Prayer Group meets every Monday at 1:30pm in the Faith Formation Center from September to June. They follow the school calendar year. Liturgy Committee meets the first Monday of each month at 7pm in the Rectory, from September to June. Parish Pastoral Council meets each month from September to June. The next meeting will be held on June 22 at 7pm in the Rectory. Parish Finance Council meets each month from September to June. The next meeting will be held on June 16 at 7:30pm in the Rectory. Fr. Charles McGolgan Council 11713 meets the 1st & 3rd Monday of each month, at 8pm in Holy Trinity Regional School Gym, 1219 Delsea Drive, Westville. Msgr. McCorristin Council 1994 meets the 1st & 3rd Monday of each month at 8pm in Holy Angels Ministry Center, 8 Green Avenue, Woodbury. Knights of Columbus 4th Degree meets on the last Thursday of each month at 8pm in Holy Angels Ministry Center, 8 Green Avenue, Woodbury. ​Baptism Preparation Parents are expected to participate in a Baptismal Preparation Class. These classes are held on the second Monday of the month at 7:00pm in the Worship Center. Please call the Parish Office, Thursdays and Fridays, to register for the class and to schedule a Baptism. Evangelization Ministry meets the first Thursday of each month from September to June. Health & Wellness Ministry meets the third Thursday of each month at 7pm, from September to June in the Ministry Center. Music Ministry/Choir meets every Tuesday from 6:45pm until 9pm from September to May.